We start our day with the apps, whether it is a fitness app, social app or an alarm/ Reminder app. Our lives are now incomplete without smartphones and apps. Assuming that many of us are very conscious of our health and fitness. From reminding us to be hydrated to calculating the number of calories before we eat the cake, all the task does the app. Apps play a huge role in a human’s life in the same way today’s life is incomplete without a smartphone. In previous days, the healthcare industry has seen profound changes. From finding cures to previously deadly conditions to finding better means for streamlining modes of treatment. To build up a better doctor-patient experience, Science and technology have worked together. In this, healthcare APIs have played a key role. Application Programming Interface (API) enables independent software to connect with each other. Here the API acts like a bridge between the applications. Regardless of how mobile app development has taken place, it allows data to flow freely. APIs have built the way for digital healthcare transformation, enabling the trust of the patients, and confidence in healthcare providers’ mind. To work more efficiently with partners, insurance firms, and many more, several healthcare companies have initialized the use of mobile and web applications. Let’s go ahead and explore it further. API has changed the game of the digital healthcare industry, attracting significant investors like Google and Yelp. They have just started investing time and money in healthcare and fitness mobile app development. APIs in digital healthcare facilitates the assimilation of these health apps to ecosystems as well as individual devices ensuring the access safety and health data storage. No matter who you are, a healthcare provider who wishes for obtaining and providing the more up to date information about the patients. A health care company who wishes to create the platform for the better exchange of health information. It doesn’t matter, what matters is APIs are equipped to help you with everything you need and want to achieve. The digital healthcare APIs aims at being able to monitor the vitals of the patients which they can report to their doctors in real time. For assumption, if you are a diabetic patient, you can record the blood sugar level in real time and then consult you can your doctor for further treatments. This procedure will result in a quick and efficient diagnosis and treatment in future times. This would make things easier for patients and healthcare professionals. How API can Bring Change in Digital Healthcare? There are several analogies that explain the functionalities of APIs. Amongst them, one is known as “wall-socket” analogy. Instead of connecting to a new appliance for the energy source, it is only required to plug it to acquire energy. All you need to know here is whether the plug fits the socket right or not. No need to know about the notion of electricity and its deliverance. To the point, acquiring the energy from the socket is an indication to the information that the software contains. Here the socket represents the API which facilitates the request and obtains the answer of the same. The appliance indicates the newly developed software which will need acquired information in a suitable way. Not just the subject-matter experts, the innovators are also viewing that widespread use of API can be effectively beneficial for enabling health data exchange as well as interoperability. 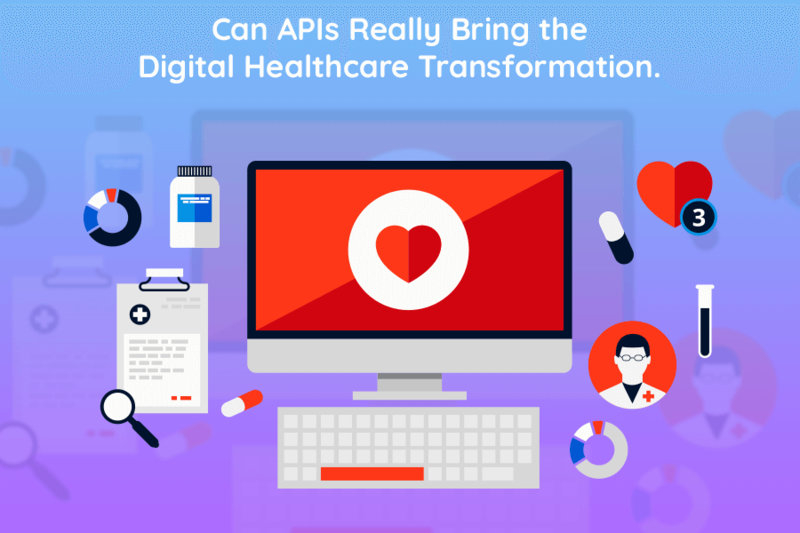 Beyond the imaginations, APIs could also open the new horizons for IT developers and to investors who are priorly not experienced in the healthcare industry. Data availability via APIs would help create a new group of healthcare developers. These developers may not have the particular, relevant expertise during the clinical data security who can create valuable tools. This would make the digital healthcare industry realize the potential of enormous data resources efficiently. The well-documented guides for developers, mobile app development team, as well as IT departments of hospitals, will be wishing to combine their services with the healthcare APIs. Besides the better healthcare management for patients. APIs can also help utilize the maximum of electronic healthcare records via third party software. It will be easy to retrieve all patients data from one place, to generate bills, schedule appointments better, save time and ensure the doctor handles the significant number of patients. Besides being ill, one has to manage all the records and billings of their healthcare. Now with the help of effective APIs, this can be taken care of. You just need to rest, all of the records will be saved with the APIs help. Even if you are changing your healthcare providers, no need to find and dig out the old files and making unnecessary calls, you can access your health records via a single click. APIs are going to take the clinical research to another new level altogether. Sometimes the researcher is unable to draw a conclusion from the studies and this is because the subjects involved are minimal numbers. With efficient health APIs, the researcher ensures that they obtain the most accurate results via accessing the records of many patients having a particular type of diagnosis. The best part here for the patient is they can hide their personalities and can contribute to research vastly. Using the complications in the mix systems, apps, and technology, the healthcare operating systems are even worse to change. Usually being non-interoperable with modern technology will just make things harder as they become more outdated with time. Another major challenge you would face in the healthcare mobile app development or API is the lack of proper testing, designing and monitoring tools. This holds back the developers from creating the potential healthcare API which can be a marvel innovation. The future of digital healthcare, FHIR or Fast healthcare Interoperability Resources is no doubt the leader of tomorrow. FHIR is capable of being agitator in the healthcare industry. However, there are several technical challenges that FHIR exhibits. They can be lack of standardization, and non-ability to provide the exact results matching the patient’s need. If you follow, there is boundless growth and development of APIs in the future. And this can benefit the digital healthcare industry to grow in the near future. Mostly the online businesses realize the importance of APIs to expand globally for their operations in the future. Now if the healthcare industry follows the same path, there will be significant positive impacts on the cost and quality of the patient care, experience and innovative development in the future. Coming to keep the patients informed, help the coexistence of healthcare provider and improving patient-doctor relationships, APIs will undoubtedly the future of the healthcare industry. Older How Progressive Web Apps will Substitute Native Mobile Apps?